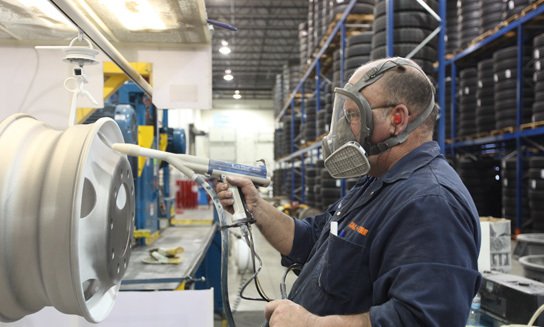 Kal Tire offers state-of-the-art Powder Coat™ wheel refinishing. Powder coating applies a nice consistent finish to your wheels, making older wheels look new again. The coating is available in silver, black and white, as well as other custom colours. Our new advanced system has a quick turn-around time. Kal Tire will transport your wheels to and from our coating facility in a maximum of two to three weeks. In addition to refinishing your wheel, each wheel goes through a thorough inspection for hairline cracks and worn bolt holes. This means only safe wheels are put back into service. Refinishing is the removal of all existing coatings, including rust and corrosion from the wheel surface areas and the application of a new coating to the entire surface. Prevent excessive rust or corrosion in the tire sealing area. Excessive rust or corrosion in this area may cause a tire-sealing problem and shorten tire life because of air leakage. Prevent excessive rust or corrosion on the mounting faces. This condition could possibly cause a disc wheel to become loose after being put in service. Prevent excessive rust or corrosion on the wheel disc area. Prevent excessive coating buildup on wheel mounting faces. Excessive coating buildup has the potential to wear away in use and lead to loose mountings. Bolt hole ball seats should not have excessive buildup either since this will prevent proper seating of the nuts and potentially cause wheels to become loose. How do you know when to scrap a wheel? There are various reasons to scrap a wheel, such as, distorted bead seat, cracks, flange wear, excessive run-out, distorted bolt holes. If you are unsure whether you can refinish a wheel due to damage or excessive corrosion, contact your local Kal Tire representative who would be happy to assist you.